“just walk away from the stupid.” Part of it was my dad’s voice “Teach ’em a lesson.” i’ve decided to go with dad on this one. Russonello’s piece frames the recent six-week “Americanarama” tour to argue that the tour’s roster, which included Bob Dylan, Wilco, My Morning Jacket and Ryan Bingham – represents a larger cultural exclusion rampant in the genre. Early country, folk and bluegrass have generally appealed to a predominantly anglo audience. Partly because many of the songs are from European source material performed by mostly white people. The trend in these genres have mapped closely to the trends in American society in general and, as opportunities have arisen, woman and people of color have stepped up to represent their unique take on the music. The difference is that Americana proper (and it’s cousin alt.country) have never been exclusionary. It’s introduction into popular culture came in the 80’s as MTV gave us the L.A. cow punk band Lone Justice , featuring the gritty soul of Maria McKee, and their “Ways to be Wicked” and “Sheltered videos in rotation with Jason and the Scorchers and The Georgia Satellites on the 24- hour feed. At the same time kd Lang and Roseanne Cash joined Steve Earle, Dwight Yoakam and Lyle Lovett in shaking up Nashville. Soon after bands like The Meat Purveyoyers, Freakwater , Neko Case, Gillian Welch, the Cowboy Junkies, Hem, Tarnation – all bands prominently featuring female artists – laid the groundwork for Americana. Hardly the good-old boys club that article paints for the genre. The claim that Americana is “carrying on the legacies of black gospel and blues” is specious. True, some artist incorporate gospel and blues within their style, to say that Americana is carrying on the legacy of those sage musical genres is insulting to these thriving genres and their decades of practitioners. And the argument that since the genre appeals to a particular segments of the population signifies that genre exclusion of others is ridiculous. Much of music is self-identity. If a segment of society don’t see themselves in the performers and their stories it follows that they wouldn’t be compelled to buy the music or attend the shows. Early hip-hop was a primarily African -American cultural phenomenon which has now transcended. As for as I know on one was accusing hip-hop of excluding anglos. Just as people of color have taken different roads to Americana, and have contributed to it’s evolution. Los Lobos and Alejandro Escovedo bring a uniquely chicano take to the music. 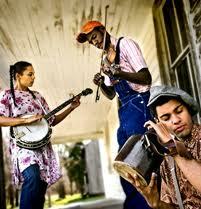 The Carolina Chocolate Drops and newcomer Valarie June have infused the genre with African-American string-band and folk-soul influences receptively. This is just lazy. Though the form, the music and singing styles harken back to a yesteryear , topics are either contemporary, like Isbell, Todd Snider and Steve Earle or dealing with the great human truths – love, hate, death – that transcend any time period. Though the article does a serviceable job of tracing roots music’s trajectory thorough time, the conclusion shows a bias of the writer. Anything this white and male met be a conspiracy..
Americana does reflect an idealized notion of the the past (as Americans are prone to do,) but to confuse the predilections of subjective taste enjoyed by some as a kind of organized Jim Crow-style musical segregation insults a music and musicians that I celebrate daily. It also, ironically, displays a type of bigotry that all cultural forms must undergo some forced, artificial desegregation toward some imagined moral purity. I dismiss his argument solely based on his jazz credentials. He should have named the article, Why Isn’t Americana More Inclusive Like Jazz Which I Think is More Multi-Cultural, (But Still Predominantly Male). It’s a superficial piece which fails to scratch the surface of a complicated genre. Both Kinds of Music, goof call, but even jazz grew into it’s diversity. Ot didn’t start out that way. Joshua, great stuff. I wish I had seen The Ebony Hillbillies when I lived there. I don’t get why Russonello felt the need to take such an unprovoked swipe at Jason Isbell. And for a jazz fanatic, I would think he would be more understanding of a musical genre that celebrates its history and targets an older audience. Being what I like to call an AmeriCajun artist, I struggle with choosing whether to promote myself and my music in the Folk realm, or the Americana realm. Folk music tends to focus on the carrying on of the traditional form while Americana draws influences from the forms. My latest CD is a broad jump outside of the boundaries of Cajun music. This article has been helpful, to me. Seems ridiculous to criticize any body of music or music-makers on the basis of the demographic it (for whatever reasons) appeals to. It’s not the fault of your neighborhood cellist that most classical fans are way past the Medicare-eligiblity age. Ain’t nothing inherently evil about a little stratification. Even so, you can always count on a posse of outraged rabble-rousers to come out of the woodwork every time society refuses to be perfectly homogenous. Gets tiresome. I have a suspicion that “Americana” means something a little different to everybody. It’s not the World Bank. Nobdoy controls it and nobody has the exclusive right to define it. When I think of the term, I most definitely include styles like country blues and zydeco. Others may not. No sense in anyone getting all indignant about a term whose meaning is so subjective, I don’t think. Alright, take care, Baron. Appreciated your rebuttal to that silly article.